The most important part of this review has to come first: The Duck-Rabbit Craft Brewery's Rabid Duck Russian Imperial Stout contains 10% ABV. That's a lot. A lot. And I think it was a mistake. The first thing I thought of when I set eyes on this beauty was a great Mitch Hedberg joke (paraphrased here): "I think Pringles originally was going to make tennis balls. But on the first day of production a truck of potatoes showed up. Pringles was a laid back company, so they said 'f*** it, cut 'em up.'" I think that's what happened here. One day the Duck-Rabbit guys were making their milk stout (which is excellent by the way), when they forgot to put the top of the vat back on and whammo! the beer's ABV skyrocketed. And since these guys are chill and from Farmville, NC (no, not that Farmville), they said "f*** it, bottle it up." They put a Russian style hat on their creepy duck-rabbit logo and viola a new accidental beer was born. This beer was so accidental it's not even listed on their webpage. As unintended as it may be, it sure is a doozy. It's super duper dark and slightly viscous (it pours and looks like Coke) and has one helluva strong smell and taste. It tastes like a typical stout, slightly like coffee and chocolate, but amped up because of the extra alcohol. There is a slightly bitter aftertaste that lingers for a while after each sip. And as with any other stout, it is nicely paired with ice cream (Ben and Jerry's Pistachio Pistachio in my case). I picked up a single 12oz bottle for $1.79, which is a steal for any beer, let alone for one with this high of an ABV. I wouldn't drink many of these in a row though, unless I wanted to get tanked really fast for cheap (now that I say that, hmm......). It is a very filling beer, so don't plan on doing somersaults or running a beer-taco run (drink a beer, eat a taco, run a mile, repeat...) with these guys. Unless you want to puke. A lot. Over and over again. I'd definitely pick this up again for a cheap thrill. 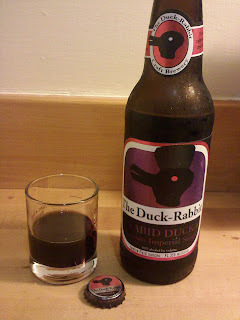 The Rabid Duck is a fine addition to The Duck-Rabbit Craft Brewery's line of beers. Keep your eyes open for these guys, they're making waves. Waves of delicious dark beer. Guest review from the lovely wife: she took one sip, then immediately spit it out on the front deck. She wasn't a fan.